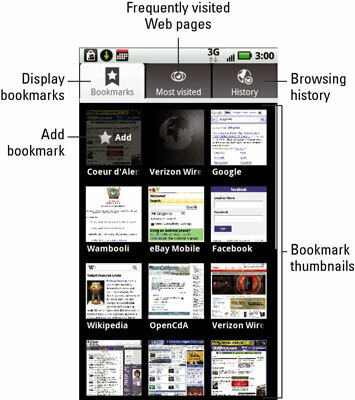 When you want to access the Internet on your Droid X, start the Browser app. The Droid’s Browser app is a lot like a standard computer Web browser but with a few important differences. Look for the Browser app on the main Home screen, or you can locate it on the Applications Tray. 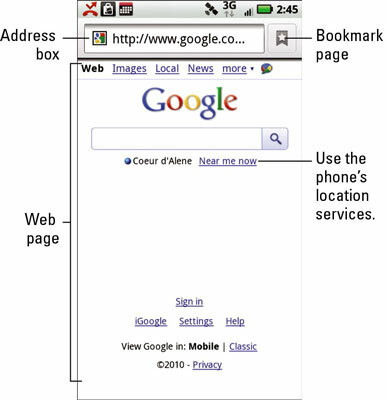 If you don’t see the Address box, swipe your finger so that you can see the top of the Web page you’re on. The Address box lurks at the top of every page. Type the Web page’s address into the Address box. You can also type a search word, if you don’t know the exact address of a Web page. Touch the Go button to visit that Web page (or search the Web, if you entered a search word). To reload a Web page, press the Menu soft button and choose Refresh from the menu that appears. Refreshing updates Web sites that change often, and the command can also be used to reload a Web page that may not have completely loaded the first time. To stop a Web page from loading, touch the X button that appears to the right of the Address box. The X button replaces the Bookmarks button. Go back. To return to a previous Web page, press the Back soft button. It works just like clicking the Back button on a computer’s Web browser. Go forward. The Forward button also exists in the Browser program: Press the Menu soft button and choose Forward from the menu that appears. Press the Menu soft button, and then choose Bookmarks from the menu that appears. At the top of the Bookmarks page that opens, choose History. To clear the History list, press the Menu soft button while viewing the History list, and then choose Clear History. Visit the Web page that you want to bookmark. Touch the Bookmark button, found at the top of the Browser window. The Bookmarks screen appears. The screen lists your bookmarks, showing Web site thumbnail previews. The Add button appears in the upper-left square on the Bookmarks screen. It has the name of the site or page you’re bookmarking just below the square. If necessary, edit the bookmark name. The bookmark is given the Web page name, which might be kind of long. You may want to edit the name to something that can fit into the thumbnail squares. To open a link in another window: Press and hold (or long-press) that link. Choose the command Open in New Window from the menu that appears. To open a bookmark in a new window: Long-press the bookmark and choose the command Open in New Window from the menu that appears. To open a blank browser window: Press the Menu soft button and choose New Window from the menu that appears. Press the Menu soft button and choose the Windows command from the menu that appears. All open Browser windows appear on the screen. Switch to a window by choosing it from the list. Or you can close a window by touching the X button to the right of the window’s name.